This story plot is a BIG WOW.... I love the AR story line and JW/Bin is a great cast as a class act jerk first lead.... not sure about PSH casting (sometimes I watch her performance and it comes across clearly as plain acting and doesn't lead me to believe convincingly she IS the character , if you get what I mean) ... anyway her performance seems aliitle lacking to me now but this is only ep 2. Hope she exceeds the current status quo. This show is like 100x better than 'fluttering...something' which turns out to be such a feeble attempt at K drama by Viki. No directors and companies willing to work on Viki drama? Thank goodness this show come on when I stopped watching kDrama as all dramas seem run of the mill and none was eye-catching. If only Master of Sun male lead tried out this leading role too, but he might not be as strong as acting as a jerk as Bin. I have watched most HB's drama and I acknowledge that this is the best I have seen him so far- the nuance, the feeling and all but I believe that this is also brought abt by PSH as admitted by him. I mean if the synergy with a co actor is right, one tends to reach its utmost ability to act. On the other hand, as attested by the critical Korean audience, SH acting this character is also well received. It maybe relative to the audience but majority finds her acting engaging. So far, her character here is just a foil to HB's character and she is making the best of how fewer a screentime her character has. sings OST 3 "Is You" I believe the lyrics highlights HJ feelings towards JW. PSH looks stunning and Im glad its the cover of this single. We heard a snippet of it at the end of ep 6, the english lyrics: "my heart is you.... my love is you"
2. From their interview Emma is an NPC and a healer, is JW in a hurry to reach level 5 so he can talk to her and she can heal him? His wound was sustained because of Dr. Cha who is an NPC now since he is dead, it was sustained in a game duel but healed in a real hospital. How will Emma figure in this game then? 3. How will SJ survive when he is even invisible in the eyes of JW who is still trapped in the game? Hmm. How about PSH teams up with PBG as a Couple in future drama? Is that idea appealing? Because I don't know what I'm gonna do if MOA relationship turned up like Hyun Bin and YooNa at Confidential Assignment movie - Hahahaha, it's hilariously disappointing pair. “Memories of the Alhambra” actress Park Shin-hye has donated washers to firefighters. Park has donated 50 million won ($44,000) for the purchase of 20 such washers for Seoul’s Gangdong and Songpa Fire Stations, as well as fire stations in Park’s hometown of Gwangju. The actress plays the female lead in tvN’s weekend TV drama “Memories of the Alhambra,” which is also available on Netflix. She takes on the role of the older sister of a missing genius game developer. You know, this show reminds me of an old David Cronenberg flick called eXistenZ. Although that was more VR than AR but there's something familiar about the way the line between reality and fantasy gets blurred in this. Already I sense the layers of various realities at work. Anyway it's just a thought... I've only watched the first episode and a little of the second so I could be jumping the gun here. I don't doubt the young lad has literally got caught up in his own game in some fashion and I certainly hope some kind of explanation can be given. I jumped on board for a look-see because of the writer, who penned the wonderful Nine. 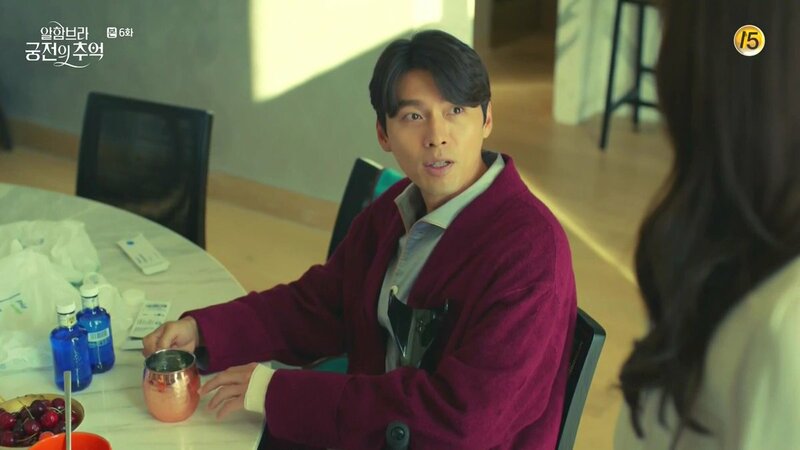 Always glad to see Hyun Bin especially after three years... and nice to be reminded of what a terrific performer he is but in truth it's really the concept and the writer that are the biggest drawcards for me. Surprisingly humorous although more chuckle eliciting stuff than laugh-out-loud. I did enjoy watching HB's somewhat hoity toity CEO trying to unclog the toilet and "navigating" his way around the single room on the sixth floor.